Cost is something that a business must incur to create and deliver value for its customers. However it is far from the reality. Businesses do incur costs that do not create value or costs that add little value to its customers. 'So what's the big fuss? Just remove costs that add no value and your job is over'. well it's not as simple and easy as that. Each cost, rather each expense item that figures in the financial statements of a company conceals both 'wanted' and 'unwanted' costs. Chaff should be carefully separated from wheat as otherwise wheat could be mistakenly thrown out. Operational issues and problems (OIPs), a business virus, cause unwanted costs and to ward off against this virus a company needs to take a systematic approach that may require changes at various levels and things, in-depth training and a change in attitude. OIPs and guarding against them is a big topic that could fill many blog posts. But for the moment we will focus on a n approach to cost reduction. 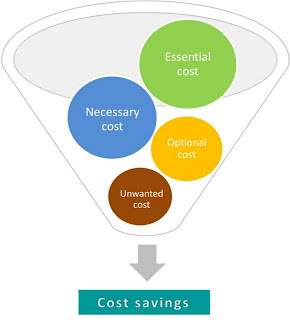 If you are on a cost cutting mission then I would recommend you to consider the following approach to cost reduction. We can classify costs (not in the cost accounting way) into four different categories viz., essential, necessary, optional and unwanted costs. Essential costs are those that are incurred to create and deliver value for customers. If by any chance these costs are reduced then a company will be compromising on the value it offers. To distinguish essential cost from the rest, ask the question what if this cost is removed or reduced? If the answer casts a shadow on quality, customer satisfaction, or sales capability then stay clear of it. Necessary costs are those incurred to keep the business running. Certain employee related expenses, statutory costs and the like do not add much value to the customer but are necessary. It's hard to reduce these costs but they can at best be monitored and kept as tight as possible with some rules and tinkering. When a company can afford luxury it incurs optional costs. They also help boost the image of the company among employees, customers, industry, analysts and the lot. It may not be possible for a company to entirely root out optional costs as some of it, when reduced, can damage the image of the company. But with effective PR and communication most of the negative impact of reducing optional costs can be avoided. For each expenditure falling under optional cost ask, what would happen if this is removed? If the answer is not damaging and the company can afford to remove it go ahead. If there is one cost that requires most attention and effort to deal with then it's got to be unwanted costs. 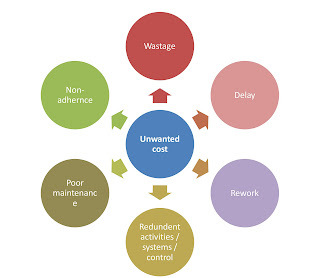 Generally six sigma and lean management interventions help companies achieve significant cost reductions as they attack unwanted costs head-on. There are case studies that claim 40 - 60% cost savings. But one thing can be said with confidence that operational issues and problems (OIPs) present huge opportunity for companies to achieve greater and recurring cost savings. The picture given alongside captures some of the factors that contribute to unwanted cost. They reside in every process and activity right from the top to bottom. Many a times they may not be obvious and would require lot of questioning to identify. To identify and attack unwanted cost, scan each process, raise questions, scrutinise decisions and actions. A picture will emerge out of this exercise and that act as the basis for eliminating unwanted cost. Form a team to handle the whole cost reduction exercise. Start from understanding what is essential, necessary and optional from companies' point of view. It would also be a good idea to explore people's mind on what these could be. Once this picture emerges and is clear then straight away attack optional costs by questioning each item under that. Form a separate team with a clear mandate to attack unwanted cost. Good one ! Lot of effort has been put in making the slides ..
Costing is a strategic tool , merely cost cutting wont help any company ,. all the costs should justify the volumes , the productivity and efficiency .. that is why strategic budgeting becomes important for any company and post analysis of budgetary costs becomes even more vital ..